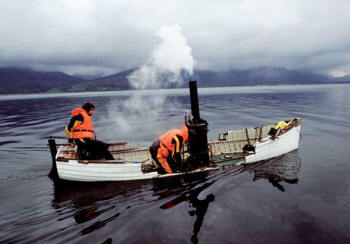 So the steamboat eventually sinks, and this gives it a tragic quality. It's based on a comic cliché. One of the inspirations was Tom and Jerry cartoons. Slapstick, self-destructive, Laurel and Hardy-type thinking. Comedic and with a pathetic sense. The work evolved out of a strip of water where the nuclear submarines come and go up to Coulport and Faslane. And one of the starting points for the work was the culture of protest which has developed in response to it and this idea of constantly keeping the nuclear deterrent as an issue in the press by trying to stop a nuclear submarine with a canoe. These are very dangerous and slightly self-destructive acts which are all about dramatising that situation. I had a really nice experience when I took my students from Frankfurt to Scotland and we went to visit the submarine base, but the PR guy kept interspersing his talk with slapstick moments from British sitcoms as a kind of half-hearted attempt to humanise what was going on there. It was a bizarre counterpoint. You hear this as an issue in the press: how should scientists make science and technology understandable. And in fact this is something that your work does in some ways. That piece is a very open work. People bring their own narratives to it. For some people it's very much about unsustainable use of fossil fuels. Its a simple little narrative structure that seems quite rich. What determined your choice of pieces for the St Ives show? There are themes to do with travel and materials, but not as many references to Modernism as I expected. Can you explain how Modernism functions in your work? In the early days I used it as a set of coordinates for orientating myself, temporarily and spatially. So wherever I went in the world I found examples of international Modernism, whether in Australia or wherever. It gave structure to my travels, like a pilgrimage. I lived for ten years in Glasgow, which in some ways is a provincial situation for an artist. The geography of the practice developed out of that and being very aware and self-conscious about my position in the world, and what it meant to travel and to operate on the peripheral. Henry Moore has also been useful in that respect because he's everywhere. These bronze things falling from the sky! They're everywhere you go. He was the first British artist to have that kind of global career. He become a surrogate for my own travels, so wherever you go you find him. I made this project in Toronto which was a replica of one of his sculptures which was one of the first of his works to go to America in the 50's, called Warrior with Shield. I made a steel version of that which I put in Lake Ontario for 18 months. It grew zebra mussels on it, and I fished it out and exhibited it. 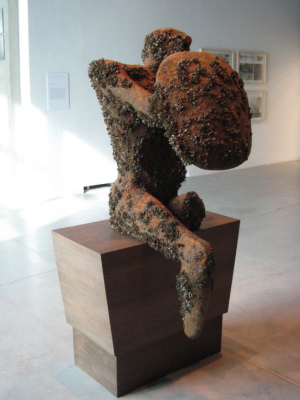 Moore's sculpture was inspired by a pebble that he had found on the beach originally. No they're still there. There is a conservator working hard to make that happen! It was about thinking about Moore and his relationship to the Cold War and the way he was instrumentalised by politics, and also, the way he played with that. So themes of cultural colonialism also come to the fore. And that's another important element in your work. The provincial versus the global. There was this word that was used the 'glocal': the combination of the global and the local, and in a way there's always that in my work. The mapping that's going on is very much of that kind. The show is about following one or two threads in the work, through to some sort of an end point. So it's often about starting with an idea for some local project, so to say, then tracking the ideas back through the practice and thinking 'that could be interesting in relation to this'. I love exhibition making. There's art-making but exhibition making is a big tool of the artist. People talk about environmental art or ecological art. Your work is not always thought of in this context. Maybe but I've been in a lot of 'green' shows in the last few years. Some of them have been great. 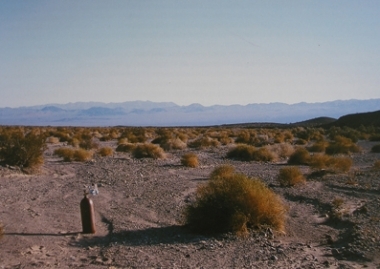 It's a difficult genre because environmental art is not easy to define. It can be anything. Yes. There has been a rash of those exhibitions popping up around the world. But it seems to be dying down about now. Some people have this idea that environmental art has to depict nature or the natural world, but your work still seems environmental without really doing this so much. It seems very much about exploring historical and technological processes as if they are themselves, giant organisms or ecosystems. The work itself is ambiguous. It's not always politically correct in relation to these things. Like the work that I made in Germany with the cactus from the south of Spain where I used the engine from my Volvo to create a heating system to keep the cactus warm in Northern Germany in the winter (Kakteenhaus (picture above left)). How overtly political should an artist be? I like the work to engage with political and economic ideas, but not to do so in a didactic way. I'm not a preacher. I'd feel uncomfortable with that. But those things are very much there or thereabouts in the work I'm making. I often talk about a balance between poetics and politics and finding common ground between them. But I'm cautious of work that deals directly with politics, because there are better mechanisms for doing that. 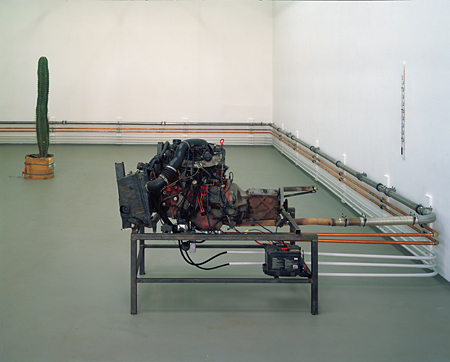 I've read that you admire the simplicity in works like Robert Barry's inert gas pieces (picture above right). But your work is different. It has a complexity, both aesthetically and conceptually, and I wonder if this is conscious on your part: that you seek to embrace complexity. There's a complexity. But at another level there is a simplicity that relates to Barry. His whole practice was about not making anything. The dematerialised artwork. It was about mediation as much as making. Which is something I find interesting, but I'm also very interested in stuff. And the inert gas piece is about stuff; about matter. Some of the works, like the poster stack of photos of the clay pits made for the St Ives show, is a fantastically simple work. What did you make of the clay pits in St Austell? They're funny things. I've driven through Cornwall many times, and I've never really seen them. They're like the backside of the county. They're quite alarming. They're brutal in a way.